What Is a Cross Between a Yellow & Zucchini Squash Called? As the season passes the leaves on your zucchini plants grow larger. You may find that these large leaves actually shade the growing zucchini squash on the vines and prevent necessary sunlight from reaching the vegetables. Help your zucchini squash to grow large and make sure you do not miss any to harvest by cutting the zucchini leaves with pruning shears. Choose zucchini plants for pruning that have at least four zucchini squash growing on the vines. Do not prune the zucchini plants any earlier than this or you risk interrupting the fruit production of the plants. Clip the largest leaves from these zucchini plants with the pruning shears. Cut these leaves near the base where the leaf stems connect with the main stems. Leave the upper leaves on the zucchini plants (these are the smaller leaves). Leave any leaf nodes (future leaves) so they will develop on the stems. Cut off leaves that appear brown, shriveled or dead regardless of where they are growing, clipping them off with the pruning shears where the leaf stems attach to the main stems. Wash zucchini and slice into 1/4 to 1/2 inch disks. Bring a pot of water to a boil and cook (blanch) the zucchini for 2 to 3 minutes. Transfer the zucchini to a bowl of ice water and allow to cool. Freeze the cooked disks in plastic bags. They will be good for up to six months. Wait for your zucchinis to fully mature in your garden before you pick them. They're ready to harvest for seeds when the green variety turn yellow and the white species darken into a beige shade. Zucchinis require a minimum of two full months to fully ripen from seed. Pick the zucchinis and bring them inside when they are ready. Put them in a cool, dry area of your house that you won't need to use for some time. Let them sit and dry out for about a month. Some larger zucchinis might require nearly two full months to desiccate. 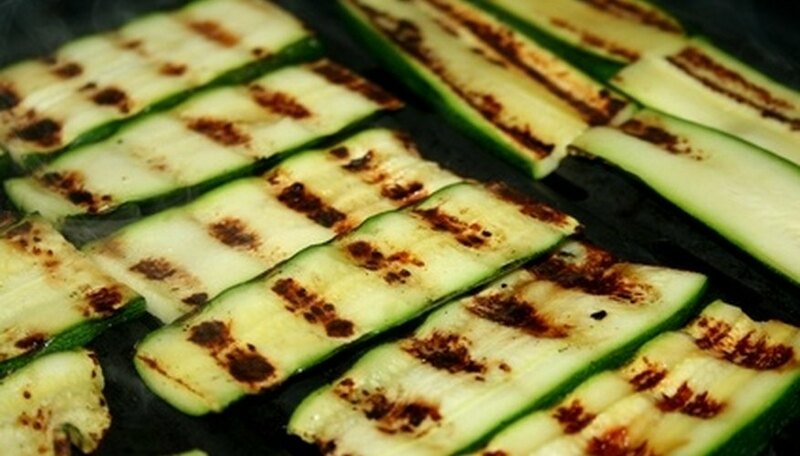 Cut the zucchinis in half, lengthwise, once they have dried out. You'll see seeds that are fully mature and ready to harvest in the center portion of the zucchinis. Scoop out the seeds from the inner, fleshy areas and put them into a strainer. Wash them thoroughly to remove any fleshy matter. Take the clean seeds out of the strainer, and spread them out onto paper towels. Spread them out evenly so all of the seeds can thoroughly dry out. Leave them to sit and dehydrate for about one to three days. Collect the dry seeds and put them into a paper bag. Store them in a cool, dry place for next year. Zucchini is susceptible to a number of pests, ranging from aphids and cutworms to cucumber beetles and spider mites. Use an insecticidal soap or spray to help prevent these problems. Wrap a zucchini plant with a small paper collar at its base to protect it from cutworms--these small gray worms gnaw the squash off at the base. A strong spray of water often can remove aphids and less serious pests. Zucchini plants--as well as other types of squash--may suffer from squash blossom end rot, which results in veggies with squishy, soft or rotted ends. This common issue is caused by a lack of calcium. Check the plant's soil--ideally, the soil should have a pH between 6 and 6.5. Add lime to the soil to alleviate this problem. Remove the infected squash. 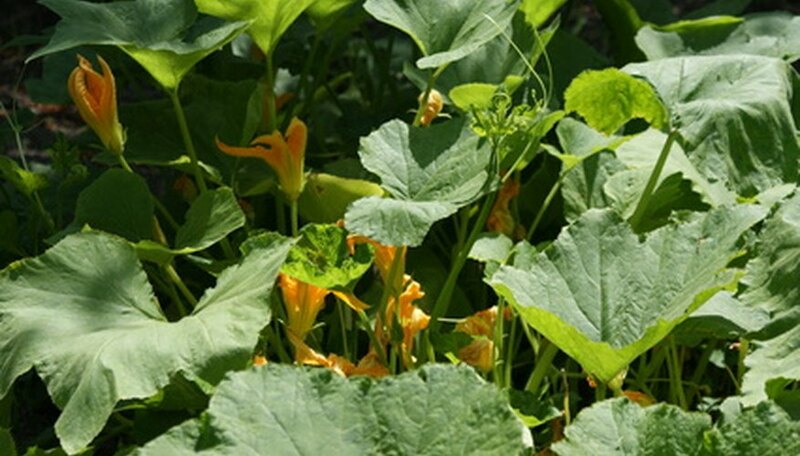 Spray the remaining plant with a calcium-rich foliar spray to help the plant recover and produce firm squash. Zucchini is susceptible to several types of fungus. Powdery mildew results in white spots on zucchini leaves, and usually is caused by too much watering in late summer or fall. Pick off the infected leaves. Gray, wet spots are caused by septoria leaf spot. Help prevent leaf spot by rotating crops and clearing away any debris near the plant. Apply a copper dust or spray every week and a half or so. Plant zucchini about two weeks after all danger of frost has passed or start them inside about three to four weeks early. Prepare large mounds, approximately 2 feet in diameter and 3 feet apart for planting. Plant four to six zucchini plants per mound, and then thin the plants to two per mound once they are established. Water the seeds after planting, then every two to three days until the plants appear. Once germinated, water the mounds weekly. Water the soil beneath the plant, and avoid wetting the plant. Zucchini plants grow quickly, you will be harvesting about 45 to 55 days after planting. Harvest the zucchini when small and tender, at about 6 to 6 inches long. Larger zucchini are tough and seedy. Zucchini grow fast, so once harvesting begins, you should check your plants daily. Allowing the zucchini to stay on the vine until larger will discourage new fruit. The main pest problems on zucchini are cucumber beetles and vine borers. Both of these pests can kill the plant if not controlled with insecticide. Cucumber beetles are small, striped or spotted beetles that eat the leaves of the plant and spread disease. Vine borers lay their eggs at the base of the plant. Mounding soil around the base can discourage these pests. The larvae bore into the vine at the base of the plant and eat the center out of the stems. Zucchini are susceptible to a variety of diseases. The most common problems are caused by powdery mildew and bacterial wilt. Both are encouraged by hot, humid weather. Treat the plant with fungicide as soon as either of these diseases is suspected. These diseases will live in the soil and recur in subsequent years unless treated. Zucchini stores well when frozen. 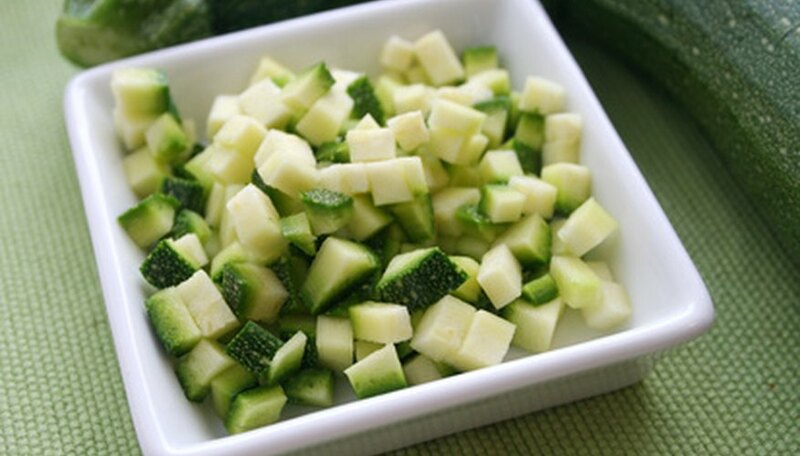 Prepare tender, young zucchini in the finish form you will need by slicing or grating. Dip in boiling water or steam for two minutes. Allow to cool, seal in airtight freezer bags and freeze. When thawed, discard any liquid before using. Cut off the flower 1 inch from where the stem meets the vine with a knife or pruning shears. Choose male flowers instead of female flowers unless you want to lower the harvest. Place the zucchini flowers in a bowl or colander and rinse under cold water. Refrigerate the flowers for up to 48 hours. Fry the zucchini flowers in a batter of 1/4 cup white flour, 1/4 cup water and 2 tbsp. whipping cream. Dip the flowers in the batter, then immerse them in heated bubbling vegetable oil for one to two minutes on each side. Remove the fried flowers from the oil when they are golden and crispy, and set them on paper towels to help absorb excess oil. Steam or boil the zucchini flowers along with other vegetables or for a baked dish such as lasagna or casseroles, or drop them in your favorite soups or stews as an alternative to frying. Treat the flowers as you would a leafy vegetable such as spinach. Use a sharp knife, cutting halfway between the zucchini and the end of the stem at the main branch. Do not pull or twist the zucchini; this can damage the plant, reducing future growth. Identify the male flowers on your zucchini, which have thin stems whereas the female flowers have thick stems with a bulge where the zucchini is developing. Grasp the zucchini flower at its base with one hand while wielding a pair of sharp scissors, garden shears or a knife in your opposite hand. Cut off the zucchini flower 1 inch from where the flower stem meets the zucchini vine. Rinse the cut zucchini flowers under cold water and store in your refrigerator to preserve their freshness until you eat them. The flowers can typically be stored for 24 to 48 hours before they wilt to the point of not being edible. Small zucchini (about 1 inch in diameter) make the best pickles, but over-grown ones can make satisfactory pickles if they are halved, seeded, then cut into half-rings. I prefer to use the dill heads before they are completely mature and dry because of their soft flavor and appearance. Trim the ends from the zucchini and slice about 3/8 inch thick. Halve the onions lengthwise, then slice them crosswise about 1/4 inch thick. Layer the vegetables in a glass, ceramic, or stainless steel bowl, sprinkling each layer with salt. Cover with ice water. Place a plate on top of the vegetables and a weight on the plate. Let stand for 2 hours. Drain the zucchini and onions and rinse well. Drain again while you prepare the pickling liquid. Mix the vinegar, water, sugar, and mustard in a large nonreactive pan. Bring the mixture to a boil, then simmer for 5 minutes. Remove the pan from the heat, add the dill heads or seed and the zucchini and onions, and cover. Let the mixture stand for 2 hours, tossing occasionally. Meanwhile, fill a canning kettle with enough water to cover pint jars and bring the water to a boil. Sterilize four pint jars and scald four lids and rings. Bring the zucchini mixture to a boil in its pan and stir in the garlic and dill leaves. Ladle into hot, sterilized pint jars. Cover with lids and rings and process in the boiling water bath according to manufacturer's directions for 10 minutes at sea level. Store the pickles for a week at room temperature before using. If any jars do not seal, store them in the refrigerator and use the contents within 2 weeks. Since zucchini squash and yellow crookneck squash belong to the same species (Cucurbita pepo), they can be successfully crossed. The result of this cross-pollination is called either a yellow or golden zucchini. When Is a Crookneck Squash Ripe? Which Vegetables Grow Best in North Carolina?